We offer a full range of restorative and preventative dental treatments including tooth colored fillings, crowns, veneers, dental implants restorations, bridges, dentures, sealants, tooth whitening, and periodontal therapy. We work closely with excellent Bay Area specialists and coordinate all necessary treatment. For those patients fortunate enough to have dental insurance, our staff works tirelessly to help our patients maximize their benefits. Our office is conveniently located within walking distance of the Colma/Bart Station. Parking/Handicapped Parking is provided as well as a ramp for our wheelchair bound patients. A comprehensive dental examination will be performed at your initial appointment. Dr. Pooler and her staff will take appropriate dental x-rays which are essential for the early detection of tooth decay, bone loss, and other oral problems. She will carefully examine your gums and perform an oral cancer screening. Dr. Pooler will take the time to explain her findings and to answer all your questions. In addition to the meticulous cleaning, polishing, and examination of your teeth, we also take the time to help our patients develop proper oral hygiene habits at home. We will evaluate your hygiene, techniques and make suggestions to your routine where needed. More than 80% of the US population over the age of 30 has some form of gum disease which can lead to slow, painless tooth loss. This can be prevented with the proper care. 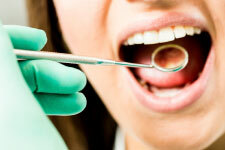 Tooth colored fillings (called composite fillings) are used to repair a tooth affected by decay, cracks, and fractures. Because composite fillings are tooth colored, they are very aesthetic and look like natural teeth. Silver fillings are still used in areas of the mouth, where a dry field is difficult to achieve. They are lower cost,can be placed faster and have served well for over 100 years. Composite resin bonding is used to repair fractures, fill in small spaces as well as cover the teeth in order to enhance their appearances. This aesthetic procedure is usually done in one visit with little discomfort and can transform your smile. Crowns (or caps) are used to restore both front and back teeth. They cover the entire tooth, thus restoring it to its original size and shape. A crown protects and strengthens tooth structure that cannot be restored with fillings. They are used on broken or fractured teeth, teeth with large fillings or decay, and teeth with root canals. They are made out of white porcelain and/or precious metals. Dental implants are artificial tooth replacements that are becoming more popular today. Implants are utilized to offer patients a foundation for new restorative teeth where natural teeth are missing or have been extracted. The implant offers the patients the opportunity to regain normal function of the teeth without being forced to resort to a bridge or a denture. A fixed bridge is a non-removable appliance which replaces missing teeth and helps in restoring your bite. 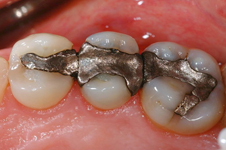 Bridges are made of precious metals and/or porcelain to achieve a natural cosmetic appearance. They prevent teeth from shifting out of position, restore chewing and speaking ability and cosmetically enhance your smile. Veneers are thin porcelain coverings that are placed over natural teeth to correct or enhance their appearance. 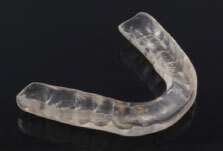 These ultra-thin “fronts” are used to close spaces, reshape chipped or worn teeth, or whiten discolored teeth. Over time our teeth tend to become discolored or stained, because of wear, smoking, coffee, and other foods. Tooth whitening is a simple, non invasive treatment used to brighten the color of our natural enamel and is an ideal way to enhance the beauty of your smile. A night guard is a plastic mouth piece that fits over your teeth and is worn at night to prevent damage caused by unconscious grinding. The forces placed on teeth during sound sleep can exceed 800lbs per square inch, thus causing sensitivity, loosened teeth, fractures, root canals and even tooth loss. Dentures are replacements for missing teeth and surrounding tissues that can be taken out and put back into your mouth. While dentures take some getting used to, today’s dentures are natural looking and more comfortable than ever before. They can enhance your appearance as well as aid in speech, chewing and digestion. There are two types of dentures – complete and partial. Complete dentures are used when all the teeth are missing, while partial dentures are used when some natural teeth remain. A partial denture not only fills in the spaces created by missing teeth, it also prevents other teeth from shifting. Sealants are a safe, painless, and low-cost way to help protect your child’s back teeth. A thin, plastic coating is bonded to the chewing surfaces, which protects them from sugary foods and bacteria. They have been used as a preventative method for over 20 years. In office fluoride treatments are also done on patients who are at a higher risk for decay. This includes children and some adults whose medications cause dry mouth, which increases the risk of decay.